Cool does not even come close to describing this dog who rides around on the back of a Harley Davidson motorcycle dressed in his appropriate attire. The dog stands on the back of the motorcycle in front of the Naval Clock which is located in Chebucto Landing along the waterfront in Halifax, Nova Scotia. 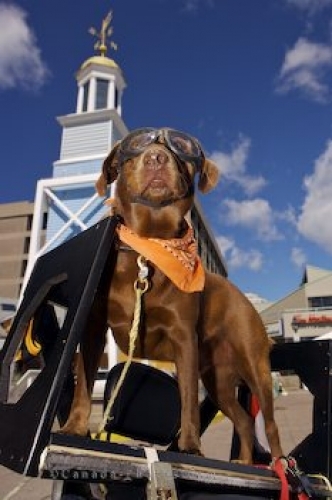 Photo of a cool dog dressed in his Harley Davidson motorcycle attire in Nova Scotia, Canada.